Quiltville's Quips & Snips!! : Easy Street to Greensboro, Day 2! Yesterday turned out to be a lovely, bright and sunny February Saturday, with temperatures hovering at a very tolerable 59 f degrees. I am not wanting to jinx what is left of this winter, but here in North Carolina – though we have seen some really cold temperatures, there has been no ice, rain, sleet, snow to really make a mess of things. Could spring really be an early guest here in the south? I certainly hope so! I arrived at our location yesterday a bit early. There was some exploring I needed to do before class. Our workshop space was a community room at the New Garden Quaker Meeting house. I am fascinated by the history of the Quakers in North Carolina, and their selfless involvement, often to the peril of their own lives, and the lives of their families and loved ones in the Underground Railroad movement that saved so many. Levi Coffin was an American Quaker, abolitionist, and businessman. Coffin was deeply involved in the Underground Railroad in Indiana and Ohio and his home is often called "Grand Central Station of the Underground Railroad"
He was born October 28, 1798, Guilford County, NC and died September 16, 1877, in Avondale, Cincinnati, OH . This marker is about a block or so away from the meeting house where our class was held, on the campus of Guilford College. Guilford College was founded in 1837 by members of the Religious Society of Friends (Quakers) and is an independent college in Greensboro, NC. What a beautiful campus! So much to discover in my OWN neck of the woods. Since we have lived here 7 years have now gone by, and I have spent much of it on the road ---I need to do MORE digging and exploring and discovering more about this wonderful state that I call home, a state with such a rich history. But I was here to QUILT! And quilt we did! The Iron Brigade! Elizabeth and Caryn! This day was all about putting the blocks together! You can find part one of this two day workshop in yesterday’s post HERE. Yesterday’s workshop had us moving on to a couple more units needed so that students would have enough of everything to have one of each block assembled by the end of the day – or more! See how they come together? This is Chris’s! Today on my agenda? BEING HOME! I don’t fly until Wednesday when I head to San Antonio for meeting with 3 different Texas guilds: San Antonio, Fredericksburg and Kerrville-- I hope to see some of you there! I plan to spend the next two days here at home in my own sewing space working on my own projects and enjoying my time home. Remember, there will be Quilt-Cam Monday evening at 9pm EST! And our drawing for the Quiltmaker Mar/April 2015 issues is THIS EVENING! Click HERE to leave your comment on that post to be entered to win. My old guild - GSAQG!!!! Have fun with them, because I sure have a lot of fun with you! Can't wait for you to arrive in SA. I will be at Saturday's workshop. What I so much like about quilting is the same pattern with different colors. The quilt looks totally different, and it you can't figure out a block you can look at several and a light comes on. Thank you Bonnie for sharing. Wendy--It's my former Guild, too. As a matter of fact, I'm one of the original founders (The Dirty Dozen!) Several of them are gone now, and I moved away 20 years ago, still miss San Antonio! Wish I could go visit my kids, and see Bonnie, too!!! I would love to meet her, I've admired her for so long, and made so many of her quilts! Sorry Bonnie, didn't mean to ignore you and talk to someone else! I'm almost "with" you every day as I follow your blog, use your patterns, love your books! 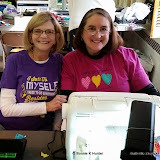 DH calls you my "quilting friend" who lives in NC! Not that I talk about you or anything like that! See you Friday in San Antonio! So excited to have opportunity to take your class!!! Just love seeing all the different colorways and happy quilters. Bonnie, I just checked your calendar (I do it frequently so I can keep up with you) and it says that you fly out of Thursday. Hope that gives you an extra day. P.S. I guess I don't have a life if I spend time on the internet keeping up with my friends! What's the rest of the purple tshirt say? It can't stop with "I need to do something besides sew"! I think the bottom of the purple T-shirt says, "Then I just laughed and laughed!" Can't wait to see how the different color ways turn out. There are going to be some awesome quilts. Got home from Texas last week. Visited those shops while there. Sorry to have missed you. Love the Kerrville shop. Hope to get back soon. I'm glad you could teach close to home this week. I have a T-shirt like the HOT PINK one. The ladies look like all had fun making Easy Street. I'll be back tomorrow night for Quilt Cam! NO Meetings on Monday evening to interrupt me. If anyone has time to read...in between sewing..."The Invention of Wings" by Sue Monk Kidd is a great story based on two real life Southern women who worked with the Quakers for abolition and The Underground Railroad.